Class Act offers half time shows, international, college and corporate entertainment, family entertainment and school assemblies. Founded in 1986, Class Act Inc., has become the largest most diversified performing artists and speakers bureau. Since then, the company has expanded to encompass multi areas such as college entertainment, festivals, corporate events and overseas tours. Diversity in all areas of the arts entertainment and sports is our calling card. We have grown and prospered because of our reputation with discerning clients throughout the world. 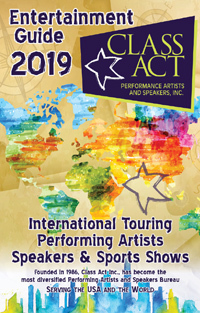 Our professional touring performing artists/ speakers / personalities deliver 200% of the time, and you can be certain of our promise for the utmost attention and focus on every detail of your event. If you don't see it here - call us, we can help! Want to know who's touring in your area? Want to know about discounts? Want to keep up with news on our artists?